When living in a multi-pet household, there is bound to be some friction. Can cats and dogs live in harmony? Sure they can! But sometimes it’s not instant harmony and snuggling between your cat and dog – sometimes convincing the dog to stop chasing the cat takes a lot of work. Now, I know what you’re thinking: this is impossible. Stuff happens, so when #1 fails, leave Fluffy a way to get out. If your cat is a tree-dweller, give the cat a place to get up and away. If the cat is a shrub-dweller, make sure there are tunnel-like areas for the cat to retreat to. The cat needs to be the most boring being on the planet – half the fun for the dog is a cat that is obsessed with fleeing in terror. If you have a cat like mine (who’s title in the household rhymes with “spit disburser”), this is no small feat: she just cannot stop investigating the dog, which turns into a chase. Not to blame the victim here, but if you have a cat that cannot be encouraged to choose a safe, out of reach spot to observe the dog, consider locking the cat in a different space when the tension gets high for a break. Also, make sure you’re expending the cat’s energy into appropriate play and one-on-one time with you, which will help make the cat willing to sleep out of reach of the dog. With Misha, who was around 5 when she met her first pet cat, we stopped the dog from chasing the cat before it even began. Misha had major prey drive when it came to squirrels and other outdoor critters, so I was really concerned about her relationship with Putzi the cat. 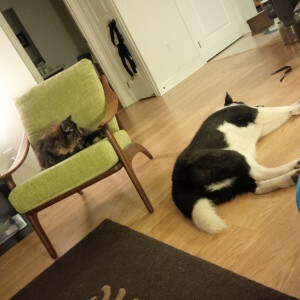 When we introduced her to the cat, we made sure Misha understood that the cat was higher in the pack than the dog. We did this through semi-dominance exercises, in which the cat was always physically above her. We asked the dog to go into a submissive position and emphasized the cat’s dominance by holding her over the dog (not dangling!). Any interest in the cat was discouraged with a swift “NO!” and a firm, but gentle poke to the dog’s shoulder. The dominance model might work for stopping the dog from chasing the cat, but there are other methods that might work better. I like positive reinforcement of good behaviour, rather than focusing on the bad behaviour. 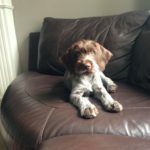 So, when the dog begins chasing the cat – or even better, just before it starts! 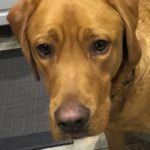 – ask the dog to do something right and reward that! Since great stuff happens when he ignores the cat and comes over to me – attention, lots of positive attention! – he does this willingly, allowing the cat to escape. Important note about this method: I do the “leave it, come here” routine at random with toys, or other things he should not be bothering, so that my smartypants puppy doesn’t decide that the way to get praise is to bug the cat. At first we did this exercise exclusively with a clicker and treats to be sure that the process was reinforced. Now it’s usually enough to just call him in a happy voice to get him to leave the cat (book, cellphone, shoe, toilet paper … ) and come get a belly rub. However, don’t forget to act like a slot machine in this case: most of the time the dog gets verbal praise and attention, but sometimes the dog gets a good treat for leaving the cat alone and coming when called. The other thing we do is praise the dog for behaving well towards the cat spontaneously. 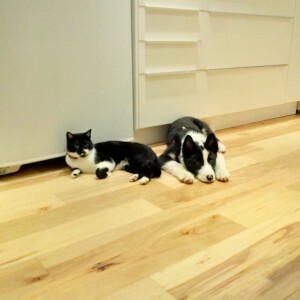 For example, when Matti and Darwin laid down in the kitchen near each other and just hung out, we told both of them what good cats and dogs they are! Since they were dropping not very subtle hints about food by hanging out by the refrigerator, they might have also gotten treats out of their positive interaction. We adopted a tiny kitten that was found at the side of the road by friends during their evening dog walk. Little Darwin was convinced from the start that he is a dog, and Misha was convinced that she could not trust us stupid humans to tend to the kitten properly. We started with the same dominance routine that we used with the first cat, because Misha was so interested in the kitten. 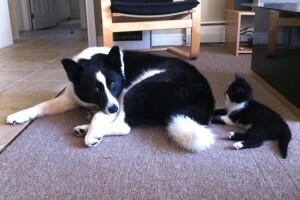 Being 20x larger than the kitten, she could accidentally damage him trying to play. However, we quickly learned that her parental side was strong. The dog adopted the kitten, carefully cleaning him and tolerating his crazy kitten antics with nothing more than an eye roll at the humans for ever questioning her intentions. Have you got any tips or trick to stop the dog from chasing the cat? How have you convinced the dog to leave the cat alone? Leave us a comment! 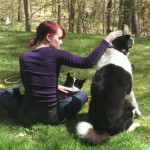 Opal is a contributor for WOOF Now What and is the guardian of two Karelian Bear Dogs, Misha and Matti. When she’s not catering to their whims, she takes care of a herd of 3 cats and builds websites.